CENTURY CITY, CALIFORNIA—Johnny Depp is in a confessional mood. He has just confessed that he didn’t know what a movie star looked like until he watched Gone With the Wind for the first time. “My 4-year-old daughter (Lily-Rose) watches the movie a lot, and I’m embarrassed to say that I had never seen it. So, when I stumbled into a room recently and found her watching it, I sat down and watched it with her. Of course, there are those who would suggest that Depp look in a mirror if he wants to see a real movie star. But he would dismiss such a notion as utter nonsense. Even after Pirates of the Caribbean: Curse of the Black Pearl passed the magical $300 million mark at the box office, anointing him as the new King of Hollywood, and his peers seconded the nomination with a Screen Actors Guild award and an Oscar nod, Johnny Depp just doesn’t get it. The 40-year-old actor, who successfully battled a deadly disease called teen heartthrob-itis that threatened to strike him down during his stay on the TV show 21 Jump Street, and then fought off the possibility of commercial success in a 13-year, unbroken string of oddball film roles, is a movie star in spite of himself. “I never wanted to build a movie-star career,” Depp explained between puffs of an ever-present European cigarette in the presidential suite of the St. Regis hotel in Century City. “I don’t even understand that kind of thinking. Depp, whose latest film, the Stephen King-inspired thriller Secret Window, opened Friday, flew to the United States from his home in the south of France to attend the Academy Awards and to promote the new film, in which he plays a tormented writer living in an isolated cabin fighting writer’s block and assorted demons. 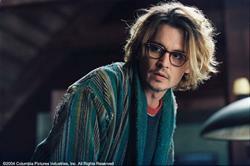 Filming on Secret Window began the week before Pirates of the Caribbean opened, and the casting process began long before that. Director David Koepp said he had to convince the studio to hire Depp, who has a history of appearing in under-performing movies. “I really had to work to get him into the movie,” Koepp said. “Johnny’s always been respected as a fine actor, but he’s never been known as a person who opens movies. Koepp, who wrote the screenplay for Secret Window based on a King novella, said he broke his own rule against assigning a particular actor’s face to a character during the writing process. “Johnny sort of popped into my head midway through the first draft, and he wouldn’t leave. But the more I thought about, the more it made sense. Depp dropped out of school at 17 in his native Kentucky to pursue a career as a rock guitarist. He never quite made it to the point of making a living at it, although he now owns a rock club, The Viper Room on the Sunset Strip. He got into acting after his band moved to Los Angeles and broke up. He made his first film appearance in the 1984 horror flick Nightmare on Elm Street, and later was cast in Platoon, just before he began his three-year stint on 21 Jump Street. He clearly hated the attention he was receiving in the media, and he seemed to go out of his way to mock his heartthrob status by starring in the John Waters’ film Cry-Baby. When he left the TV show for good, he hooked up with director Tim Burton in the admired but strange Edward Scissorhands, the first of several collaborations with the offbeat filmmaker (Ed Wood and Sleepy Hollow would follow). His choice of roles has been questioned by others, but never by Depp himself. “I have no regrets,” he said. “I am glad I did every single role. “My career was never about commercial success,” he added. “I was in it for the long haul. I decided early on to be patient and wait for the roles that interested me, not the roles that would advance my career. I never wanted to be remembered for being a star. So, when he met with a Disney executive to discuss the possibility of being a voice in an animated movie, he said he was not trying to make a smart career move. Depp, dressed in blue jeans, a long-sleeve blue shirt and a wrist-full of silver jewelry, said he had no idea that Pirates was a big-budget movie with strong commercial aspirations. That might have dissuaded him from taking the role. 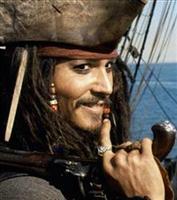 Playing his pirate character as a slightly effeminate, slightly inebriated version of Rolling Stones guitarist Keith Richards (a friend of Depp’s who seems to have taken the impersonation good-naturedly), Depp unexpectedly found himself in unfamiliar territory—a bankable star fresh off a commercial success. “I had never experienced that before,” Depp said with a laugh. “And it’s been fun to visit Hollywood and talk to studios as a bankable actor for a change. Depp said that, although he’s having a ball as a “movie star,” he’s not taking any of it seriously. And if that sounds like a terribly mature attitude, coming from the former bad boy of Hollywood, chalk it up to his 40th birthday. It’s tough to be an irresponsible bad boy when you’re 40, and in a serious relationship with two children. “Turning 40 has been great for me,” he said. “My 20s were total confusion, and in my 30s, I was constantly trying to figure out who I was. But I like the feeling of my 40s. I like the man that I’ve become. “I’m well-rooted into fatherhood now (he and his live-in girlfriend, French actress and pop singer Vanessa Paradis, have two children), and I’m not confused anymore. I don’t feel I have to numb myself from my responsibilities. I’m even looking forward to getting older.